The flow rate, static pressure and acoustic noise are always trade-off. It is very difficult to think over these factors at the same time. Further complications are caused by improper applications as well. For example, fan mounted to chassis improperly may cause vibration and flow disturbance which leads to higher acoustic noise. A proper system air impedance design Higher system air impedance needs a higher static pressure fan, but It accompanies with higher noise. Give an enough space to your critical parts and place them at flow path as possible. But It is at a tough work to get space for thermal solutions In a slim and light. However, we recommend you to measure you system air impedance and collect enough parameters to know your (triangle symbol) Pi. Normally, most specialized fan manufactures will support you to measure it by Air Chamber. Choose a proper fan that is based on Qeff We have illustrated you a method to figure out a right fan for Qeff, and then you should consider about power consumption and acoustic noise. Which one is the first priority? To evaluate these two parameters under the same O base is Y.S. TECH’s recommendations. Check the fit between proposed fan design and the application area. 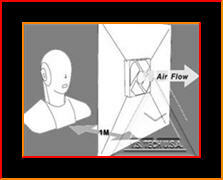 Vibration and Flow Disturbance always cause resonance and get higher acoustic noise. 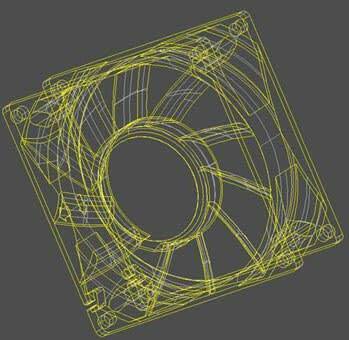 A proper fan mounting and flow field design may decrease acoustic noise. For example, mounting with a rubber cap on high-speed fan model will decrease vibration resonance. Review your design to make sure there is enough margin space (over 1.5mm) at flow in let /outlet side and no any stuff to disturb flow filed. Advance fan speed control by your thermal profile. Thermal profile is similar to fan performance profile. Normally, different function will need to dissipate different power consumption. Then we can modulate fan rpm and ask fan working on a proper rpm by different system function. The most popular advanced fan speed controls are PWM control (Pulse Width Modulation), Thermostat control (NTC) and both of them. Sound Quality Analysis In cooling fan industry, we are always focused on Sound Pressure only in the past but there is no longer sufficient to us because even though legal regulations have lead to a reduction of noise limits, the tendency of people to feel disturbed by noise is increasing. A sole reduction of noise levels is thus not sufficient to reduce the annoyance due to noise to a degree noticeable by human beings. This is due to the fact that the subjective human aural perception is often disregarded. However, the judgment of a sound event involves a wide range of different parameters forming into the total hearing impression. So we are not only concern about sound pressure but also [Sound Quality]. ANECHOIC Room Noise Measurement System. Digital Head Measurement System, 16-bits version. SQ lab Ill, Mobile Multi-channel Analysis System.